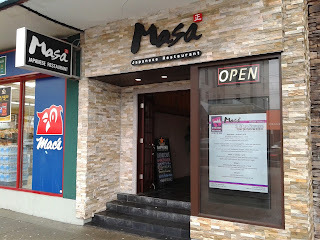 Sometime last year, the old Kaneda Japanese Restaurant got replaced with the newer and fancier-looking Masa Japanese Restaurant. I once claimed that as soon as you cross Cambie St. heading west, restaurant prices immediately double, and for the most part, that has turned out to be the case. 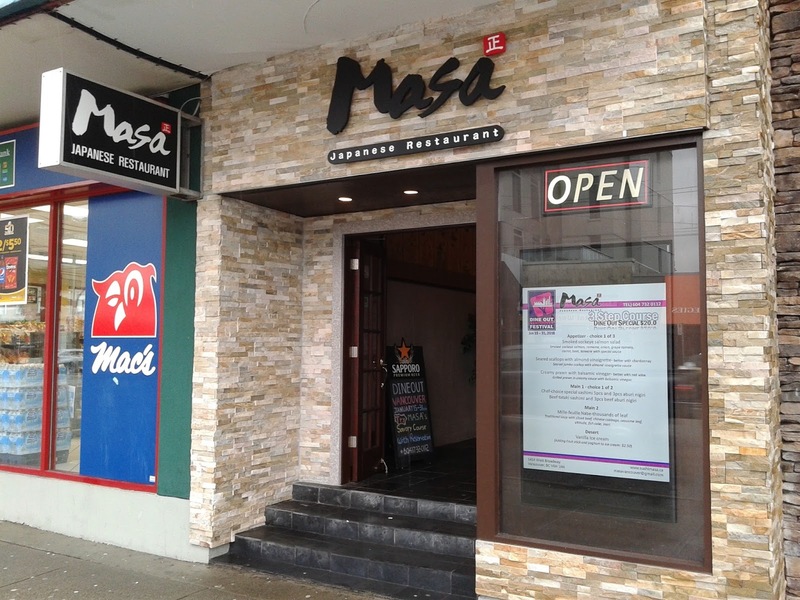 Seeing Masa Japanese Restaurant's modern wooden-brick-themed entrance and its very spacious second-floor dining space, I had always assumed it to be a pricey venue for sushi. 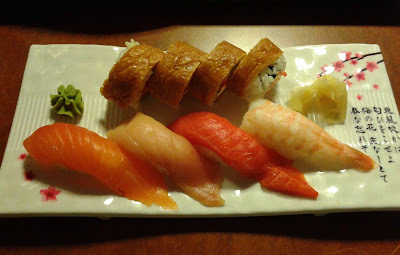 I was quite surprised to see $2.95 California rolls and $1.25 salmon nigiri on the menu, but being the glutton that I am, I still managed to spend over $30 on lunch. I wanted to try their Dine Out menu, but apparently, they only serve it for dinner. However, I need not have worried, as they had a variety of affordable, large lunch courses for me to choose from. Of course, I went for the biggest one, the Masa Course, which came with a beef steak, a deep-fried prawn, and too many other items for me to count. They provided each person with a serving tray, but I ordered too much food to fit on one tray, or even two, so I did my usual thing, which was to borrow the table beside me. Next, a trio of appetizers arrived at my tabel. The Pickled Baby Onions were juicy, but had a very strong dill-like flavour, which I disliked. 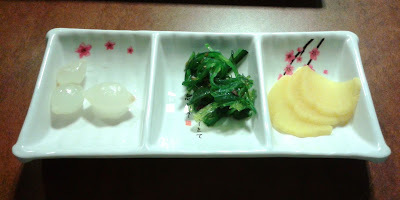 The Wakame (seaweed) was better with ample moisture and flavour. The Oshinko also had enough flavour, but it was overly dry and lacked the juicy crunch that I was looking for. 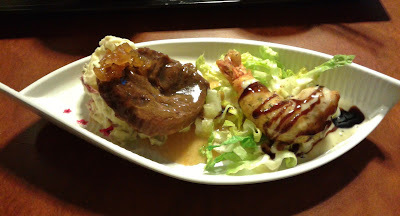 The Masa Beef Steak consisted of a thick, chunky cut of braised beef resting on a mashed potato salad. They provided me with a fork and knife, but did they really expect a clumsy guy like me to be able to cut that steak horizontally into three or more slices? Nope, I just took small bites out of it instead, and though it was not as tender as I had hoped, it was still more chewable than it looked. It was juicy in some parts, but the parts near the center were rather flavourless. The Deep-Fried Prawn was reminiscent of Miku's Ebi Fritter, and it came with a large prawn. The batter was bread-like and appropriately adorned with spices. The prawn was flavourful with help from the sauces but also a bit chewy. Nonetheless, I enjoyed this item. 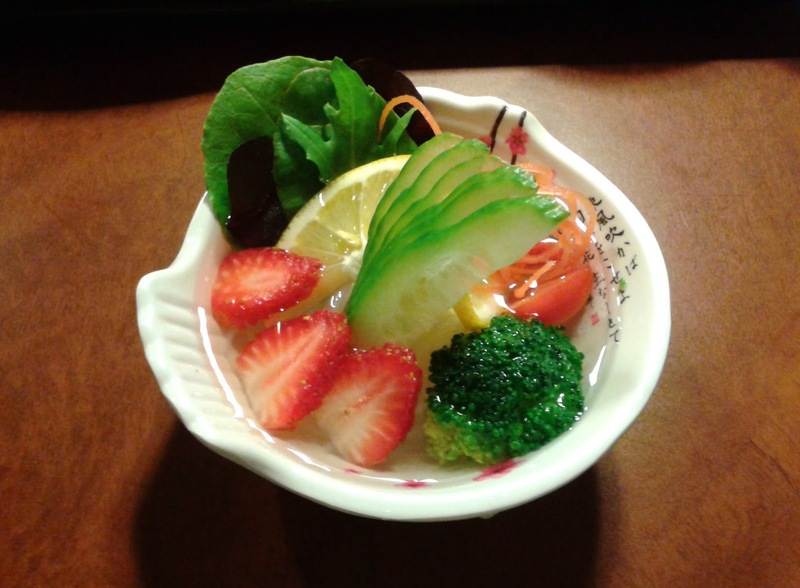 The Sunomono was very colourful and graced with small strawberries, broccoli, a slice of lemon, a few mixed greens, cherry tomatoes, and some thinly sliced carrot. I could see the entire grocery store in there. It wasn't the most impactful Sunomono I have had, but there was a decent amount of citrusy tanginess to go along with the rice vermicelli underneath. The Kale Gomae came with large pieces of kale dressed with sweet sesame sauce. The kale was somewhat hard to chew due to the size of the pieces. 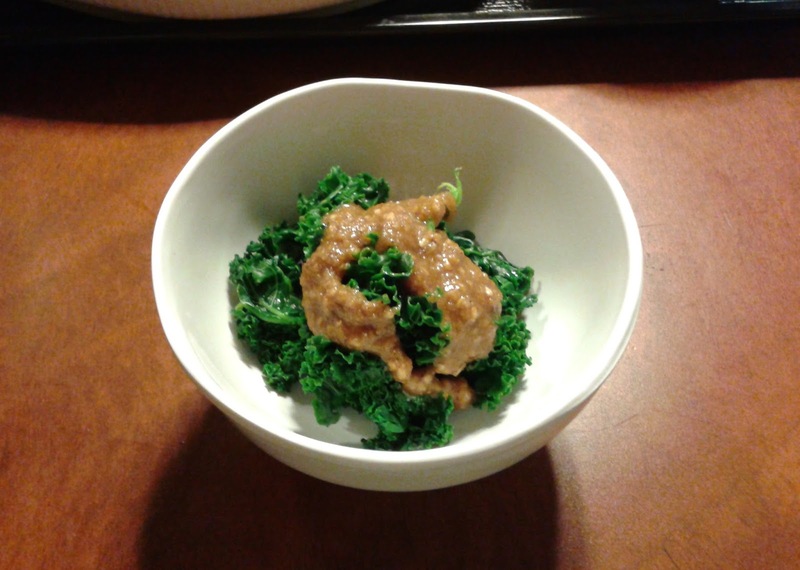 It was leagues away from Miku's version, and I wished the sesame dressing was spread more evenly throughout the kale. At last, we come to the final dish of the Masa Course, which came with a special roll. The waitress could not come up with a name for the roll, so I put my epic name-generating abilities to the task. The Salmon That Had a Bean Curd Umbrella came with inari (bean curd), crab meat, avocado, salmon, tobiko, and cream cheese. I liked how they used the cream cheese conservatively, and it produced a nice melty texture. 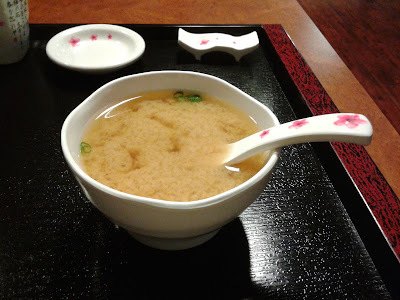 The thin layer of bean curd added sufficient sweetness to the roll, which had a creamy, soft texture overall. 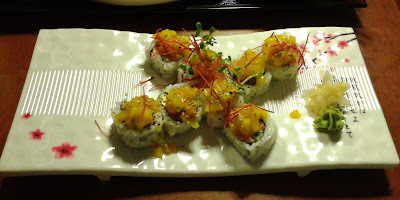 Moving on to the nigiri, the Salmon Nigiri had a glossy texture and a creamy flavour, though it was cut a bit thin. The Tuna Nigiri was not exactly a highlight as the tuna was slightly mushy. The Sockeye Salmon Nigiri, on the other hand, tasted fresh and had a delightful sweetness. Finally, the Ebi Nigiri came with a thick and chewy prawn on some slightly dry sushi rice. This could be because it took me a while to get to the nigiri, but then again, I can't take the blame for the fact that they brought the dishes out way more quickly than I could finish them! After finishing the Masa Course, I tried their aburi (seared) nigiri, and they tasted better than they looked... well, sort of. 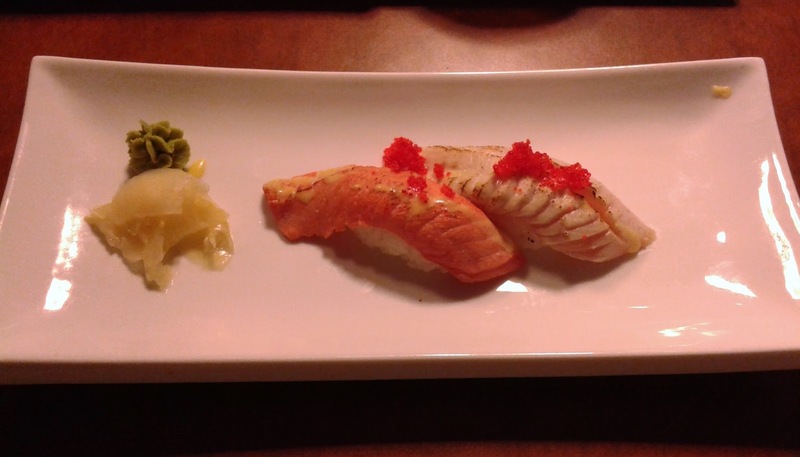 The Aburi Salmon Nigiri came with soft salmon, which had a tasty smoky flavour. The honey mustard added a subtle sweetness to the salmon, while the formation of the rice was quite good. The Aburi Toro Nigiri also had a soft texture, but it was lacking in flavour. I found the service to be quite friendly, and they did not rush me out of the restaurant even though I stayed until 3:15 p.m., at which point everyone else from the lunch crowd had already left. I didn't have any surprisingly good dishes, but this is a decent restaurant considering the price and the location. If you're looking for budget sushi in the wealthy people's corner of Vancouver, it hardly gets better than this! The Salmon That Had a Bean Curd Umbrella...you came up with that name? LOOL!! You: I ordered this for you. Yes I did come up with that name! And LOL that's an excellent way to break up... thanks for the relationship advice!